What scene from ‘The Hunger Games’ is Jennifer Lawrence most excited to shoot? 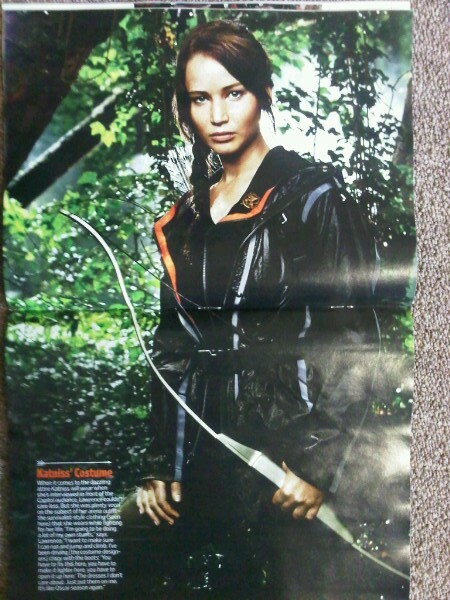 2 days ago, Entertainment Weekly revealed the exclusive first look of Jennifer Lawrence as Katniss Everdeen in The Hunger Games. The 20-year-old Oscar nominee was first turned onto Suzanne Collins? beloved dystopian trilogy, about children forced to fight to death to amuse a brutal government, last Christmas. Her mother, who runs a summer day camp in Lawrence?s hometown of Louisville, Ky., lent her her own dog-eared copies and Lawrence fell fast and hard. As she gobbled down the books, two scenes stuck out as ones that would be a particular thrill for any actress to play. With filming on Gary Ross? movie kicking off this week in North Carolina, she?s living the dream. ?The first time that Katniss has to go into the cylinder and she goes up into the arena and looks around and sees it for the first time,? says Lawrence. ?Knowing that when that trumpet blows she could die. The thing that?s great about her is she?s not a murderer. She?s a hunter, but she?s not a killer. I told Gary, ?I totally understand if you don?t hire me, but please remember that after Katniss shoots a bow and kills someone her face cannot be badass. It has to be broken.? She has to be heartbroken because she just took another person?s life. It?s so tempting, especially with a cool, big budget franchise movie, but we have to remember that she?s a 16-year-old girl who?s being forced to do this. These kids are only killing each other because if they don?t, they?ll die. It?s needless, pointless, unjustified violence. So there?s nothing cool about her. It?s not like she looks around the arena and goes ?Yeah, I got this, I?m going to do this.? I think she looks around terrified and thinks, ?Well there are all the million different ways that I can die.?? ?It?s from Catching Fire,? she says. ?When she finds out that she has to go back and she runs in and has a complete meltdown ? I remember reading that and being like ?I want to act that!?? For more on The Hunger Games, including photos of Jennifer Lawrence as Katniss and a guide to the film?s other characters, pick up the new issue of Entertainment Weekly, on stands May 20. 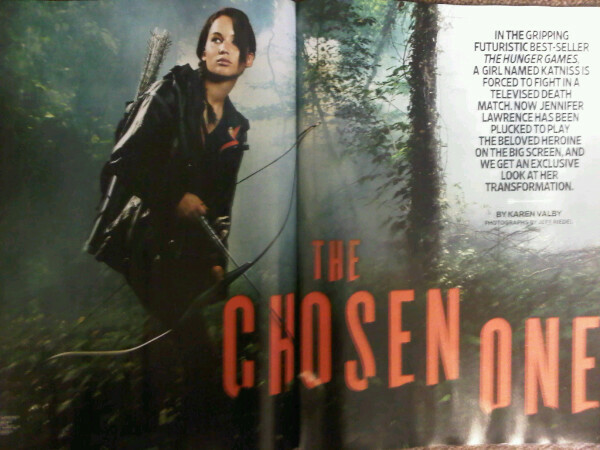 More photos of Jennifer as Katniss! We have more photos from Entertainment Weekly, thanks to Epnebelle, who has just posted it on twitter! I can’t wait for full article and high quality scans, and you? :) Remember, print edition of EW, is on newsstands this Friday! X-Men: 1C – exclusive clip titled “You Can Show Off”. Yahoo! Movies has posted new exclusive clip of X-Men: First Class! It features James McAvoy’s Charles Xavier, Jennifer Lawrence’s Raven Darkholme and Rose Byrne’s Moira MacTagger as they are introduced to Nicholas Hoult’s Hank McCoy by Oliver Platt’s The Man in Black aka head of Division X. “X-Men: First Class” is coming out in the U.S. on June 3. I can’t wait! 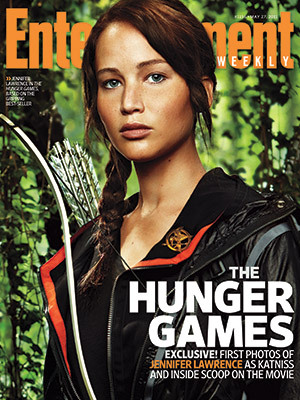 Jennifer as Katniss on the cover of EW! Entertainment Weekly has posted first promotional photo of Jennifer as Katniss Everdeen, The Hunger Games heroine! What do you think about Jennifer as Katniss? As far as I’m concerned, she’s perfect! Fans of The Hunger Games ? Suzanne Collins? terrifically urgent dystopian trilogy about children forced to fight to the death ? have always been protective of 16-year-old heroine Katniss Everdeen. So when Lionsgate and director Gary Ross announced that they had cast 20-year-old Oscar nominee Jennifer Lawrence (Winter?s Bone) in the lead role, the community was thrown into an inevitable tailspin. Was she too old, too blonde, too pale, too pretty to do the gritty warrior girl justice? In this week?s cover story, EW was granted an exclusive interview with a newly brunette Lawrence, and spent hours watching her train on a Los Angeles archery range and track, just days before she was due on the North Carolina set. In a free-wheeling interview, Lawrence describes her first encounter with Ross last winter, during the height of Oscar season. ?He was asking me what the experience was like,? she recalls, ?and I just kind of opened up and said, ?I feel like a rag doll. I have hair and makeup people coming to my house every day and putting me in new, uncomfortable, weird dresses and expensive shoes, and I just shut down and raise my arms up for them to get the dress on, and pout my lips when they need to put the lipstick on.? And we both started laughing because that?s exactly what it?s like for Katniss in the Capitol. She was a girl who?s all of a sudden being introduced to fame. I know what that feels like to have all this flurry around you and feel like, ?Oh, no, I don?t belong here.?? When Lawrence was offered the role, she describes her response as a mixture of elation ? and desperate anxiety. ?I knew that as soon as I said yes, my life would change,? she says. ?And I walked around an entire day thinking ?It?s not too late, I could still go back and do indies, I haven?t said yes yet, it?s not too late.?? And yet, who can turn their back on Katniss? ?I love this story,? she says, ?and if I had said no, I would regret it every day.? After officially signing on, Suzanne Collins herself called to offer a starstruck Lawrence her most hearty congratulations. ?I feel like when you said yes,? the author told her, ?the world got lifted off my shoulders.? 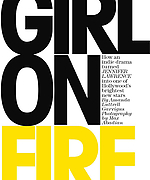 Photo gallery update – Flare and Elle Magazine scans. Hello everybody, I’ve added to our photo gallery scans from the newest issue of ELLE Magazine (with Rachel McAdams on the cover) and Flare, a Canadian fashion and style magazine.